In 90-degree heat on an afternoon in May, a homeless man sleeps on a brick sidewalk behind Chase Bank in Pacific Beach. His face is sunburned and cracked under grey hair and grey beard. 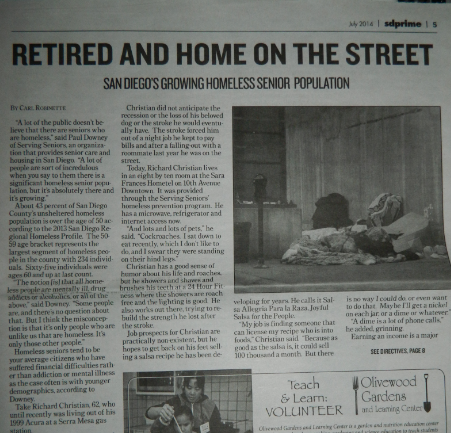 He is part of a growing population of senior-aged homelessness in San Diego County. About 43 percent of San Diego County’s unsheltered homeless population is over the age of 50 according to the 2013 San Diego Regional Homeless Profile. The 50-59 age bracket represents the largest segment of homeless people in the county with 234 individuals. Sixty-five individuals were ages 60 and up at last count. Homeless seniors tend to be your average citizens who have suffered financial difficulties rather than addiction or mental illness as the case often is with younger demographics, according to Downey. Take Richard Christian, 62, who until recently was living out of his 1999 Acura at a Serra Mesa gas station. He landed there after a series of setbacks that started about 10 years ago when his mother fell ill and eventually died. Before that he had been a financial-services professional for more than 13 years. Christian did not anticipate the recession or the loss of his beloved dog or the stroke he would eventually have. The stroke forced him out of a night job he kept to pay bills and after a falling-out with a roommate last year he was on the street. Today, Richard Christian lives in an eight by ten room at the Sara Frances Hometel on 10th Avenue Downtown. It was provided through the Serving Seniors’ homeless prevention program. He has a microwave, refrigerator and internet access now. Christian has a good sense of humor about his life and roaches, but he showers and shaves and brushes his teeth at a 24 Hour Fitness where the showers are roach free and the lighting is good. He also works out at 24 Hour, trying to rebuild the strength he lost after the stroke. Job prospects for Christian are practically non-existent, but he hopes to get back on his feet selling a salsa recipe he has been developing for years. He calls it Salsa Allegria Para la Raza, Joyful Salsa for the People. “A dime is a lot of phone calls,” he added, grinning. Earning an income is a major hurdle for homeless seniors, and one of the major challenges for organizations that help them, said Downey. The weak job market is part of a perfect storm that has been brewing in San Diego for the last decade, putting many seniors between a financial rock and a hard place. It started with the overall rapid growth of the senior population in San Diego along with the rest of the country. Then the Great Recession hit and then came the jobs crisis. Finally, the dissolution of California Redevelopment in 2012 ended a primary financial engine for affordable housing. Using property tax revenue, California Redevelopment allocated 20 percent of its funding to affordable housing. Then the 2011 Budget Act essentially ended redevelopment and reallocated funding to local governments and to bond payments for education and other programs. “The ultimate solution is for the governor and the legislature to figure out a way to replace what was lost when they disbanded redevelopment in this state and basically took the dollars to fund the state budget,” Downey said. The City of San Diego has identified funding for motel vouchers that provide some housing relief, but with more strings attached and difficulty finding motels that accept them, vouchers are not as stable as redevelopment housing. Getting their lives back together cannot happen without services and resources in addition to stable housing, said Herb Johnson, president and CEO of San Diego Rescue Mission. Richard Christian now lives on services like social security and pieces his health coverage together with Medi-Cal, Indian Health Services and Veterans Affairs services. But day-to-day Christian’s biggest challenge is dealing with isolation and boredom. His only living relative is a 74-year-old brother in Idaho. They speak by phone, but have not stood face to face since their mother died ten years ago. Others suffer from depression and even post-traumatic stress symptoms as a result of living on the streets. With more baby boomers retiring every day and less affordable housing, Downey said the population of homeless seniors will likely continue to grow.